Trading the world’s best known share indices – such as the UK’s FTSE 100, Germany’s DAX 30 or the US’ Dow Jones Industrial Average and S&P 500 – can be an ideal trading strategy for those looking to invest in equities whilst avoiding bundling all their eggs into one basket focusing on individual companies. Diluting the risk attached to company-specific news does not make indices any less interesting. On the contrary, thanks to their links to larger groups of companies and wider market sentiment, they tend to offer interesting movements in both directions on a more regular basis. Additional benefits include 24 hour trading with futures markets open Sunday night to Friday night, lower margin requirements and the option to trade both long and short. Placing an index trade is a simple affair, carried out on a ‘pound-per-point’ basis. For example, if you believe the FTSE 100 will rise over the course of the next hour, day or week because you are expecting a boost to market sentiment or you are witnessing positive technical signals on your price chart, you can open a long position for as little as £1 per point. If the index rises by 100pts you stand to make £100. If, the index falls by 100pts you would stand to lose the same amount. Your risk could, however, be limited to £20 by placing a protective stop 20pts below your entry level. If the trade moved into profit, your stop can always be moved to lock in any profits. If you expect the market to fall, the setup of a Short trade position works the same way in reverse. 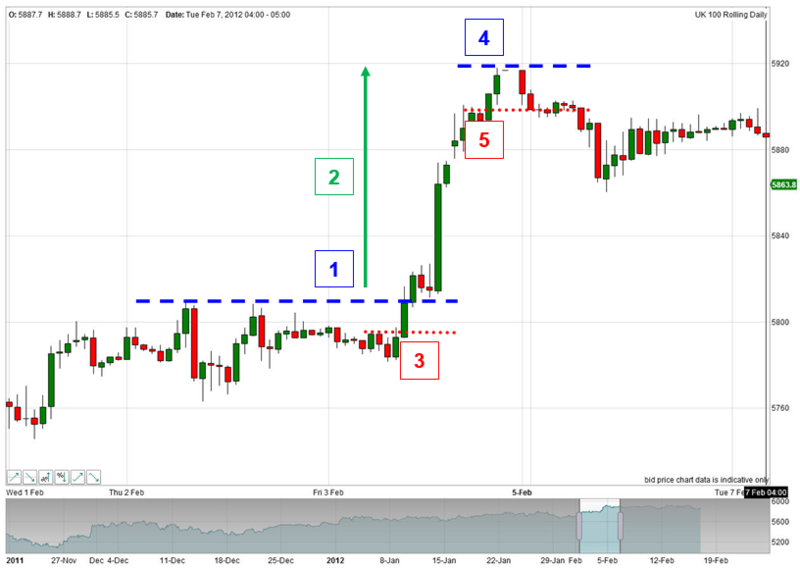 In summary, CFDs offer you a simple way to trade the indices up or down using leverage. 1. Index reaches level you wish to trade at; for example, breaking above prior highs. 2. Long position opened at 5,813. 3. Trailing stop-loss placed at 5793, limiting risk to 20pts. 4. Index rises by 106pts to new high of 5,919. Trailing stop remains 20pts behind, moving up to 5,899. 5. Index falls by 20pts from high, trailing stop triggered at 5,899. Trade closed with gains of 86pts. Had the above trade been placed on a £10 per point basis, your position would have initially been risking £200 (20pt loss x £10/point). When the trade moved in your favour the trailing stop would have moved up in-line, first to breakeven (stop in-line with entry point) then to protect profits (stop above entry point). When the index hit new highs, the position would have shown a profit of £1060. With the tailing stop still 20pts below you would be have been locking in profits of £860. Please note, however, that had you not had a protective stop in place and the index fell rather than rose, you would be liable for any declines. Other ways of helping yourself to identify an attractive trade set up include the use of technical indicators. For more, see the advanced education strategies listed on the Education home page. Whilst trade objectives are calculated by assuming and projecting a repeat of the initial up or down move, note that indicators do not always deliver exactly the same move. Sometimes they undershoot. Sometimes they overshoot. And the pattern itself is not always a neat rising or falling channel. What is most important is that overall pattern respects the general steps mentioned above. Individual technical indicators should never be relied upon in isolation for trading decisions, however strong the signal may be. Ultimately they are one of many indicators, which may, in the majority, be pointing the other way. Always use look at a range of indicators (moving averages, trendlines, price, price patterns and volume, to name a few) to assist in the final trading decision. Lastly, the current trend of a share should always be respected – preempting a change can prove costly.